A companion to the bestselling book The Elements: A Visual Exploration of Every Known Atom in the Universe, this beautiful photographic card deck features all 118 elements in the periodic table. One element per card appears as a full-size image on the front and fascinating information about the element on the back. The Photographic Card Deck of The Elements is the most detailed, lush, and beautiful set of cards ever produced on the subject of the periodic table. With 126, 5"X5" cards in all, it includes one card for every one of the 118 elements, plus additional cards that explain the arrangement of the periodic table, present the elements sorted by various properties, and suggest activities and uses for the cards. The front side of each card shows a full-size, photographic image of the element, while the back gives scientific information including atomic weight, density, melting and boiling point, valence, and the percent of the element found in the universe, in the Earth's crust, in oceans, and in humans. Graphics show melting/boiling points, density, electron configuration, and atomic radius. A fascinating fact about the element, as well as the date of its discovery, is also included. The cards are perfect for students but also make an excellent gift for a scientist or anyone who enjoys the beauty and diversity of the natural world. Ah! Chemistry. I must admit that when I was in high school and then cegep, I had a love/hate relationship with this subject. There were times I really enjoyed it and other times that I didn’t understand a thing. I remember clearly having to learn the famous periodic table by heart for a test. These days, students have nothing to complain when it comes to learning more about the periodic table. Have you did some research lately on books and other items that can be used to learn this. There are great books whether Christian based or not that can be used to learn more about the elements. Take the Photographic Card Deck of the Elements for example. Oh how much I wish I would have had this product when I was learning my periodic table. It would have helped me quite a bit since I am a visual person. Not only do you get an image of something representing the element but the back of the card contains much information about the element itself. Take sodium for example. The front of the card show a close-up image of what salt is. and gives the it’s atomic symbol and number. The back of the card contains information like the position in the table, the density, the boiling point, the gas range,the solid range, the crystal structure the atomic radius, and all the information attached to it like weight, density and so on. Apparently sodium was discovered in 1807 in England. Each card is presented the same way as the one about sodium. One of the first cards included in the box contains some activities that can be done with these cards. For example, if you stack the cards in a certain order like let’s say by atomic number and than slide the deck slightly to the left, right, or top to reveal the graphical property strips along the edges, you will see patterns on how density, melting point, boiling point, or electron configuration vary among the elements. There are also other game like Elements Go Fish for example. All sort of ideas to learn the elements and retain them in memory. The cards are easier to carry around than the book The Elements though it doesn’t contain as much images. The book definitively contains more example of where we could find the element in our daily lives. However, you can discover that by simply going to the Periodic Table website. This product can definitively be a great item to have if you are studying chemistry or if you want to learn more about the periodic table. It is perfect for students, teachers, and homeschoolers. The Photographic Card Deck of the Elements is available at your favorite bookstore, even amazon.ca. Witnessing a resurgence of interest in hand-fashioned gifts at her creative sewing business, Laura Lee Burch has developed 25 toys and gifts that families can create with love and hand down from one generation to the next. Classic designs that invoke a sense of wonder and spur the imagination, these creations will equip kids to enter a magical world of make-believe. A pirate boat has little pirate dolls and accessories, along with a pirate hat and flag. To go with a doorway puppet theater, there are needle-felted puppets for a princess and knight. 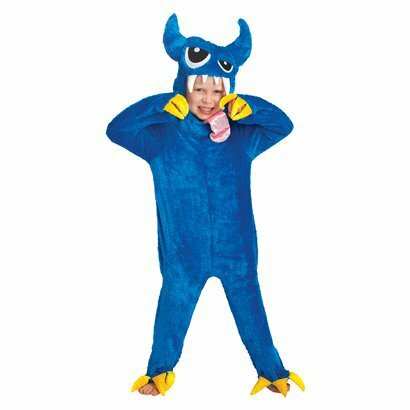 Simple costumes include a knight helmet, a stick horse, and an Excalibur sword, plus a fairy flower hat, a cape and mask, and embellished T-shirts. Other projects are a giant octopus pillow, a mermaid rag doll, a tool belt with tools, a ballet bag, a soft baby doll with clothing and a carrier, a tooth fairy pillow, and other items. This fun book will guide you to create fun toys for your kids without spending a ton of money. A tread and a needle is all you will need to put together some original toys in the hands of your children or the kids in your life. In the introduction section, you will get some guidance on how to stitch and how to proceed with certain techniques necessary in order to make some of the items in the book. The book contains numerous projects for you whether you have a boy or a girl. Here’s an idea of the projects included in this book: Little Ballerina Ballet Bag, a big octopus, a superhero cape and mask, a pirate hat, a pirate flag, a sword, a noble knight’s hood, a royal crown, a broomstick stallion, a baby doll, some baby clothes, a pop star microphone, a mermaid, a handy dandy tool belt and tools, a pirate ship and its crew. The book also contains the patterns to create all the projects. I am definitively inspired with this book and as soon as I am confident that I can manage taking such a project, I will do. Right now, I need to learn how to use my new sewing machine. If you are blessed with the gift of sewing and have children in your life who would love cool toys I would like to suggest you that you check out Sew Magical for KIDS. I’m sure you will find a project or two that will be interesting. Sew Magical for Kids is available for purchase at your favorite bookstore, even amazon.ca. Young readers explore how the human body really works with the fully interactive Human Body: A Visual Encyclopedia. What is the biggest organ? The smallest bone? The strongest muscle? Have your questions answered, then see how these body parts work. Find out how many miles your blood cells travel - then join them on a trip through the heart. Meet the engine room of the body; the beating heart, the brilliant brain, the amazing lungs, and the super skeleton. With 10 sections that explore the main systems of the body, let your child learn what makes their body tick. Perfect for the iPad, Human Body: A Visual Encyclopedia is jam-packed with interactive features, including: - 20 videos that bring organs and tissue to life - 15 3D images that illustrate how muscles and bones fit together that can be turned at the flick of a finger - 30 interactive galleries show close-up pictures of magnified cells - 60 zoom galleries take you even further into the body - touch an image to take a closer look - Find Out More galleries will make your school projects stand out with amazing facts From the top of your head to the tip of your toes, Human Body: A Visual Encyclopedia will excite and educate inquisitive minds. I’m passionate about learning the anatomy. Maybe it’s because I really enjoyed my biology class when I was in high school I don’t know but I think it is important that everyone learns how our bodies work. So when I saw this e-book I knew that it would make a great addition to our virtual library and requested the opportunity of reviewing it. Of all the e-books I have reviewed for DK Canada so far, this one has excited me the most and immediately grabbed my interest. It is unbelievably well done, very interactive with videos and 3D images and full of learning experience for young and older people. Waste Disposal – shall I give more details? However, I need to tell you that earlier this spring I had to pass a colonoscopy because my dad died of colon cancer and I was now in my 40s. My son, who is VERY interested in medicine, asked if he could watch while I was getting the procedure done. It wasn’t possible obviously but with this e-book he saw that he could watch a video of the inside of the colon. He watched it with attention and he was quite pleased of the fact that this video was included in the e-book. Life Cycle – how we reproduce. I would suggest that parents take the initiative in preparing their kids for this specific section. I strongly believe that reproduction lessons should be done at home and not left entirely in the hands of the school. In Control – how the brain and hormones works. The graphics are colorful, the close-up details are breathtaking and the information contained in the pages of this e-book will explain from A-to-Z how the human body works to your kids. This is definitively a great e-book to have to supplement your learning on the human body! You will have plenty of videos to watch (without the sound though) that will explain how the various parts of your body works. Check out some of the pages providing information on the muscular system. As you can see the e-book is packed with interesting information on the human body. Having the possibility of observing close-ups images of muscles, lungs, heart and other parts of the body is an eye opener for anyone. As I mentioned the sound is non existent in the video. However, please keep in mind that e-books have advanced tremendously in the past couple of years and video has just started to be incorporated in them. I am sure that as time goes by sound will also find its way in the pages of an advance e-book like the Human Body: A Visual Encyclopedia. Right now, the creators of such fine e-books have to keep in mind the size of the file so that it doesn’t take all the space on your iPad. I would recommend Human Body: A Visual Encyclopedia to anyone interested in learning more about how our bodies work. This e-book will bring the learning experience to a new level for you and your kids. It is a marvelous e-book to have on your iPad for your homeschool or to supplement the learning done at school as well. Human Body: A Visual Encyclopedia is available for download on your iPad with iBooks 2 or on your computer with iTunes. The price is 9.99$. Disclaimer: Thanks to DK Canada for sending me the above mentioned ebook for review purposes. I was not monetarily compensated for this review. Please note that the review was not influenced by the Sponsor in any way. All opinions expressed here are only my own. Snagit gives you all the tools you need to create engaging images and videos. Snag any image and enhance it with effects or create a quick video on your computer screen. Then you can share your creations immediately with anyone – friends or co-workers. I had the opportunity to use Snagit for an assignment while I was doing my Social Media certificate at a school in town. The assignment was to create a short video explaining the changes we would do for the social media presence for a non-profit organization. I found that it was easy to use and flexible in what you wanted to do. For me I was only taking a video of the step by step changes I was suggesting going from one web page to another to show the “client” what I was talking about. This product is perfect for business obviously as it will permit the client to visualize what you are talking about during a presentation. But this product can also be used in education when a teacher needs to create a clear graphical explanation of some concept or at home for genealogy, scrapbooking, saving online receipts or more. But I also see a wealth of possibilities for homeschoolers as well – more specifically for the high school level. Why no use Snagit to encourage your child to do a presentation on a specific subject. Ultimately, your kids will have to navigate in the workplace and they will have some skills to help them to use the technology to present some ideas, thoughts or projects to their superiors. As I mentioned earlier, the program possess a video capture tool which allows you to create screen videos for demos. These videos can be shared instantly on the social media platforms. The program will also allow you to enhance your images by combining pictures, enhancing with effects or simply magnifying a part of it. To get a complete list of the features of Snagit – simply go to http://www.techsmith.com/snagit-features-list.html. This product is different than video editing as it grabs the image of what you see on your screen immediately. Nevertheless, if you need to make a presentation of the latest changes on the system being developed, stir the interests of your students on a specific concept or simply wanting to organize your household, Snagit is a tool that can help you. You will be surprised by what it can do once you started using it. Snagit is available for immediate download at the TechSmith website for the price of 49.95$ US. It works on Windows XP with SP2, Vista, Windows 7. There is also a version for the MacOSX for Snow Leopard, Lion or higher. Disclaimer: The product has been provided for review purposes. I was not monetarily compensated for this review. Please note that the review was not influenced by the Sponsor in any way. All opinions expressed here are only my own. 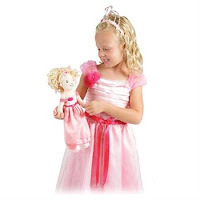 Every Hearts for Hearts Girls doll represent a real girl from a real place around the world. Each has her own story to tell and ideas about how to make life better for her family, community, country, and the world around her. They want to change the world – and You can help! Recently I stumbled on a very interesting idea on presenting doll of different countries to little girls in our life. As a family we are already investing in four kids in Dominican Republic and Thailand. We also take the time to fill special Christmas boxes for other children during the Christmas season and our kids are regularly exposed to how other kids live in various parts of the world. So when I was offered to review the Hearts for Hearts Girls, I couldn’t resist. The dolls were so beautiful that I wish I could have had one of each of them. But I received two Heart for Heart Girls to review – Tipi from Laos and Dell from the USA. Unlock the loving heart of Laos with our Tipi doll! Like all Hearts For Hearts Girls dolls, Tipi stands 14 inches high and has a poseable, smooth vinyl body, and high-quality rooted hair for hours of doll play. Her eyes are a deep, liquid brown-black and her hair is a flowing fall of gleaming black. Tipi comes dressed in a charming pale green tee with embroidered detail in bright aqua, and whimsical plaid cropped pants with flower appliqué and lace-edged pocket. Take home the heart of America’s mountains with our Dell doll. Like all Hearts For Hearts Girls dolls, Dell stands 14 inches high and has a poseable, smooth vinyl body, and high-quality rooted hair for hours of doll play. Her eyes are a deep teal-blue and her gleaming hair is a true brunette brown. A sprinkle of freckles crosses her nose and cheeks. Dell comes dressed in a summery floral top of corals and pinks, and frayed jean cut-offs of real denim. Both dolls are fabulous and the details are breathtaking. Their eyes are bright and their hair is soft. I particularly love the expression in their faces as well as their clothing and their accessories. A little book is also include to tell the story of the doll as well (though this information can also be found on the website.)! Their website also highlights the real stories of real girls from around the world. There are also online games on the website where you can have fun with your doll at the same time. Pretty neat! I helped Dell make her deliveries in the mountain just to check out the game. There are six Hearts for Hearts girls dolls available in Canada. Each and every single one of them are unique and special – Dell from the USA, Consuelo from Mexico, Rahel from Ethiopia, Nahji from India, Lilian from Belarus and Tipi from Laos. And for every doll sold a portion of the purchase price will go to World Vision to help children worldwide. What is World Vision? It is an organization that is building a better world for children and their families and communities in the USA and around the world. World Vision does this through education, water and hygiene, microenterprise, community develoipment, and disaster relief. For more information go to World Vision Canada. If you have a little girl in your life – whether your own daughter, a niece or your godchild – I strongly suggest that you consider getting Hearts for Hearts Girls doll for her this Christmas. This doll will bring not only joy for the child receiving the gift but also will help a child somewhere in the word thanks to World Vision. The Heart for Heart Girls are available at your favorite toy store. I have seen them at Wal-Mart recently! The Modular™ HighWay Construction Kit construction toy takes a unique approach, allowing true three-dimensional highways and levels to be constructed . The toy develops abstract thinking, three-dimensional perception, creativity and offers multiple construction options. Compatible with other “Modular™ Toy Construction kits”. Age 5 and up. When I was approached to review the new line of Modular toys, I immediately saw the potential for one of my nephews who loves anything that is related to cars. When I received the package I must admit that I didn’t know what to expect. I mean I saw the image and I had an idea of how the product could be put together but that’s about it. I was surprised by the quality behind the packaging of the toy. Not only the similar pieces are in plastic bags but the whole kit itself is also in a bigger bag. Seeing this tells me that the company behind the toy believes in quality control and wants to make certain that all the pieces are included in the box before selling it to a potential customer. Modular Construction Toys takes a new and unique approach to construction toys allowing a three-dimensional highway which will help your child to develop abstract thinking, three-dimensional perception and creativity during his play time. What I particularly like from the 3D Highway is the flexibility of building whatever road you would like. The construction will keep your child busy for sure. The box advertize that there is more than one million track combinations – which I tend to find a bit exaggerated since the box only contains 72 pieces but it could be possible I guess. The child will be able to plan and build his own racetrack, create endless combinations (particularly if he receives other pieces from the 3D RoadBuilder or the 3D RaceTrack. and have fun with dad or his siblings. Once built the road will be suitable for most 1:64 scale cars. In the box, you will get some fun stickers to put on your pieces as well as a little flyer giving you some ideas on tracks that can be build with the products. Four cars are also included in the box. An extractor is also included to help you disassemble the track. I really love the idea behind this product and hope that they will expand their kits to include more possibilities in the future. I would be nice to be able to build a mini town of some sort with the tracks going everywhere through it. It would be a wonderful gift to purchase for a birthday or Christmas this year. Other products like the 3D RaceTrack or the 3D RoadBuilder can complete the 3D Highway. Modular Construction Toys also have other themes like the Modular Castle Boys, the Modular Castle Girls and the Modular Characters. The 3D Highway Educational Construction Kit is available at your favourite toy store. I saw them in the ToysRUs flyer as well as in Wal-Mart. A bestselling and award-winning author, Dr. Leman has written more than 30 books about marriage and family issues, including The Birth Order Book, Sheet Music, Making Children Mind without Losing Yours, and Have a New Kid by Friday. He is coauthor, with his son Kevin Leman II, of a series of illustrated children's books for each child in the family. He is also featured on 6 video series on marriage, parenting, blended families, and single parenting. I have three boys (and a girl) – all different from each other. There are days I wonder how to deal with them. Other ones I love them to pieces. I homeschool my boys (and their sister) and I have learned quite a bit about raising them through the years. But I also know I can learn more about raising boys and siblings (being from a family of one child). So when the opportunity came for me to review a title from none other than Dr. Kevin Leman, I jumped on it because I knew that I will come out a better mom through reading this book. I am learning so much in this book – learning the importance I have in my sons’ life, how I can have an impact on him, discovering my parenting style and how I can be a better parent, handling siblings rivalry (Ah! an eye opened for me) and much more. I also learned how I can prepare my sons to their first date by building self-confidence in them and letting them take mom out on a date to practice (what an ingenious idea!). Though my oldest looked at my bizarre when I mentioned this I think that deep down he is glad that I am willing to take the time to build his confidence and prepare him for his first real date with a girl. I want to raise boys who will be independent, respect women and be able to pull their weight in the household duties when they are married. And having a book like the one that Dr. Leman has wrote is a blessing for me as it will provide guidance on how to raise my boys and how to be the best mom for them. I suspect that I will go back to this book regularly as the years go by so that I can refine my skills at being a mom for my boys. If you have boys in your life, I would strongly recommend that you consider the book What a Difference a Mom Makes to discover how to become the best mom for them. What a Difference a Mom Makes is available at your favourite bookseller from Revell, a division of Baker Publishing Group, even at amazon.ca. KanJam is a game that is gaining popularity and is based in throwing a flying disk into a container to mark points. This game originally started back in the mid 1990s when a few guys were throwing a disc into metal garbage can just for the fun of it. This game is now found in tailgating, camping, beach parties, school gymnasiums, college campuses, neighborhood parks and backyard parties to name only a few places where it can be played. KanJam consists in flying a disc into a scoring containers and make a goal. It looks easier than it is but while practicing and having fun, you are exercising yourself. Here’s the rules and point scores for the game. And believe it or not there are tournaments and leagues forming as more and more people are discovering this game. When I stumbled on this game I was curious and immediately requested to review one. Our KanJam arrived quite rapidly in the late spring and we decided to bring it with us as we spend some time in the Toronto area over the summer time. I took out the KanJam to let the kids have some fun time throwing the disc at each other and run for it. Mind you, I quickly realized that being able to put the disc inside the container was tricky whether you try on the top or through the slot in the container. It takes ability and dexterity to do so. For my kids it means practice, practice and practice some more. They enjoyed playing with this game even though they hopes to be able to score were not fulfilled. I think this game would be more fun for them when they are a bit more older and when they can get-together with other friends to play it. In a way it reminded me of Ultimate Football when you run around with a Frisbee however this time, you need to be at a certain distance to be able to score a point. What I particularly like for this specific game is that it can be used in school for Physical Education. Apparently more than 2000 schools are using it as part of their PE classes. A great way to encourage the kids to move and have fun while being outside (or indoors depending of the weather!). As for us, this game is a keeper for our camping days and we will definitively bring it with us wherever we go in the future. The KanJam Ultimate Disc Game itself can be purchase directly from the website for the price of $39.95 (at the time of this blog post). You can also find it at various stores in the US and Canada. Simply look at their store locator page to find where you can buy it. For Ottawa you can find the game at the Bed Bath & Beyond in Barrhaven and the one on Terminal Avenue. You can also purchase a KanJam Glow-in-the-Dark Kit that will bring more challenge for you and your friends when playing at night. This is currently 29.95$ on the website. Disclaimer: I received a copy of the book for review purposes from KanJam. I was not monetarily compensated for this review. Please note that the review was not influenced by the Sponsor in any way. All opinions expressed here are only my own. Sometimes it can be difficult to know what to pray for or even how to talk with God. Following in the footsteps of the popular 365 Pocket Prayers that has touched so many lives, here is an edition just for women. 365 Pocket Prayers for Women lets you grow closer to God through this honest and heartfelt collection of daily prayers. There’s a topical index in the back of the book so whether you need to pray about conflict, self-esteem issues, health and healing, your family, or a recent disappointment you’ve experienced, 365 Pocket Prayers for Women helps you open your heart to the one who listens. Each reading in this convenient, easy-to-carry, quick-access guide begins with a daily prayer and ends with a promise from Scripture. As soon as I got this little book I was in admiration with the texture of the cover and the embedded flying birds in it. I love it when publishers do something special with a book that can be carried everyday in your purse. Because this book is a definite gem to have handy EVERYWHERE you go. It is packed with prayers to uplift you every day and you can go back to your readings at any time of the day and reflect more on the scripture that is suggested for that day. What is also nice about this book is that it doesn’t begin with January 1st and can be started anytime during the year. Some days you will have a full page to read while other days you will get only half a page. The book covers issues from healing to family. Everything you can think off will be covered with a prayer. The day start with a title and a reason why you could pray that. Right from the beginning the author don’t waste time and starts the prayer. Somehow, without realizing it, it can easily fit into your life and what you are experiencing. To conclude, you can read the Scripture at the bottom of the page and reflect, journal and ponder on how it can be applied in your life. I am enjoying this little book quite a bit and it can be found closely with my journal and my Bible. Being an homeschool mom I know I need to spend time to do my devotions and I usually do it early in the morning in the living room. The kids can see me daily going to read there and learn from me at the same time. So far, I have two kids independent enough to read their Bible on a daily basis. I look forward to have all four of them taking the time in the morning to spend time with God! I would recommend this book to every women no matter where they are at in their walk in life. It can be a great tool to reflect on God’s Word and grow spiritually and prayerfully as well. 365 Pocket Prayers for Women is available for purchase at your favourite bookstore, even amazon.ca. Disclaimer: I received a copy of the book for review purposes from Tyndale. I was not monetarily compensated for this review. Please note that the review was not influenced by the Sponsor in any way. All opinions expressed here are only my own. Hasbro and Zynga Games have teamed up to bring to life some of the most popular online games that you can find on facebook. Everyone have probably heard of CityVille, Farmville and Words with Friends. These games have now many players from all around the world. I will admit that I myself tried the Farmville one but I found it a bit too time demanding to pursue the growth of my farm so I decided to remove it. So imagine my surprise when I heard that the three most popular Zynga games have come to life with the help of Hasbro and some of their popular games. So let’s look at Zynga Cityville Monopoly Game, Zynga Farmville Hungry Hungry Herd, and Zynga Words with Friends Game. It looks like the classic fast-dealing property trading MONOPOLY game, but this CITYVILLE MONOPOLY game has been reimagined like the addictive online CITYVILLE game! Buy properties, build houses, community spaces and businesses on them, and raise cash when it’s your turn. You’ll pay when you land on zoning permit spaces and get paid when you pass Go! The first player to build 4 skyscrapers wins. Become a tycoon while you build your dream city with the CITYVILLE MONOPOLY game! Includes gameboard, 4 movers, 66 buildings, 16 skyscraper tops, city money, zoning permit cards, mystery gift cards, visitor center cards and 2 dice. I must admit that I am somewhat overwhelmed by all the different MONOPOLY games out there – whether they are a real Monopoly, a Monopoly based on popular movies or one of these Monopoly wanna-be like the Canadian one or the Homeschool version, it is easy to realize that this game has made quite an impact on people everywhere. Hasbro has recently released a new version of a beloved game based on a popular online game via facebook. CityVille is similar to the regular Monopoly version but at the same time different. How’s so? Well first of all when you build your buildings you can build skyscrapers and you will purchase building like a flower shop,a bakery, an ice cream stand or a toy store. Beware as you might land on a zoning permit fee or the visitor center. You will still have the famous jail, the Go and the Parking on the board game. You will also have the opportunity to give your friends mystery gifts like a tiered fountain to decorate their neighbourhoods. The game is definitively different and will allow a new challenge as you play with your friends. However, the game only has four movers compared to the original game which contains six I believe. Also included in the box you will get 85 city cash billets for use in Zynga’s CityVille online game. If you are looking for a new way to entertain friends over this fall/winter seasons, check out the CityVille Monopoly. your hungry farm animals munch as many marbles as they can. If your animal chomps the most, you win! Game includes farm base, 4 animals, 4 marble flippers, 20 marbles, label sheet and game guide. For 2 to 4 players. I find this game totally adorable and even more fun that the Hungry Hungry Hippos. Okay I will admit that the game itself is noisy because of the yell of the kids when playing and the little balls going crazy on the main part. But having animals from the farm eating the little balls is very creative and perfect for the little ones. I particularly love the fact that they are different animals and not the same in different colors. The game is easy to play and will entertain your little ones for a certain period of time. We have the original version of this game with hippos eating the balls. But if I had a choice between the original edition and the Herd one, I will definitively pick the farm animals one just because when your kids are at the age of playing with this game, they are also in the process of learning the animals on the farm. The game also come with 50 farm cash billets to spend on your online farm if you have one. I applause the originality of this version of a game that has been known for many years now. I great way to revive the popularity of it by introducing a new environment and new animals. Have the wordiest fun right at home with the new WORDS WITH FRIENDS game, based on the addictive online game! Take 7 tiles and create words vertically or horizontally that connect to previous words when it’s your turn. If you use all your tiles first, you get to add the points from your friends’ remaining tiles to your own score. Do you have the words to win? Find out when you play the classic WORDS WITH FRIENDS game! Includes gameboard, 104 tiles, 4 tile racks and tile bag. Thirteen Million Five Hundred Thousands. That’s own many people are playing the online version of Words with Friends. I will admit I never played but I have decided to try it out today and felt somewhat overwhelmed. Though I find it similar to Scrabble, I wonder how it works with friends. I know many people who love to play the game while on facebook but I must say that I don’t spend as much time as these people on the social media even though I own a Social Media Certificate. Go figure! Needless to say,I think this game as potential for an homeschooling family. My kids are too young to be on facebook yet but eventually they will join and I can see myself challenging their vocabulary with the Words with Friends online version. In the meantime, I think we will use the Hasbro board game to discover how this game works. As much as social media is nice to stay in touch I personally find that there is nothing better than a face-to-face meeting with your friends. And after a good meal and get interactions together,why no pulling a popular game and challenge each other in a good battle of the words. To top if off, you can download a word check and a score pad for your iPod/iPhone/iPad or android device. Finally, you also get a code to redeem the Words with Friends Ultimate Play Pack which would enhance you game online. I am very impressed with the creativity of Hasbro in modifying older games into a newer and enhanced version based on popular online games. The idea of teaming up with Zynga is ingenious and I suspect that this new partnership will be fruitful in the future. I think bringing online game to life via board games is a great way to encourage families to spend time together. These three games are available at your favourite toy store in your city. 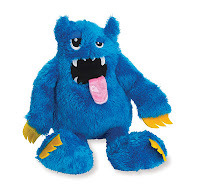 Manhattan Toy Happy Haunted Halloween Giveaway! Halloween is always a touchy subject within the Christian community. Some won’ let their kids trick or treat while other have no problems whatsoever with it. I won’t enter a debate on whether or not it is okay to let your kids pass Halloween. What I know is that as a kid I have fond memories of this special night and I never had a scary costume. We debated before having kids if we would let them walk and get candies but when we had our first child, we could hardly wait to bring him out on that special night. Our primary rule is that they won’t wear something scary. The second rule is that candies are shared in the house – and these are limited to two or three for dessert at supper time. The result is that we have candies lasting until after Christmas but we savor the plunder together as a family. Let me tell you that with four kids we have quite a bit of candies! To celebrate the upcoming Halloween , Manhattan Toy has a special giveaway for you! 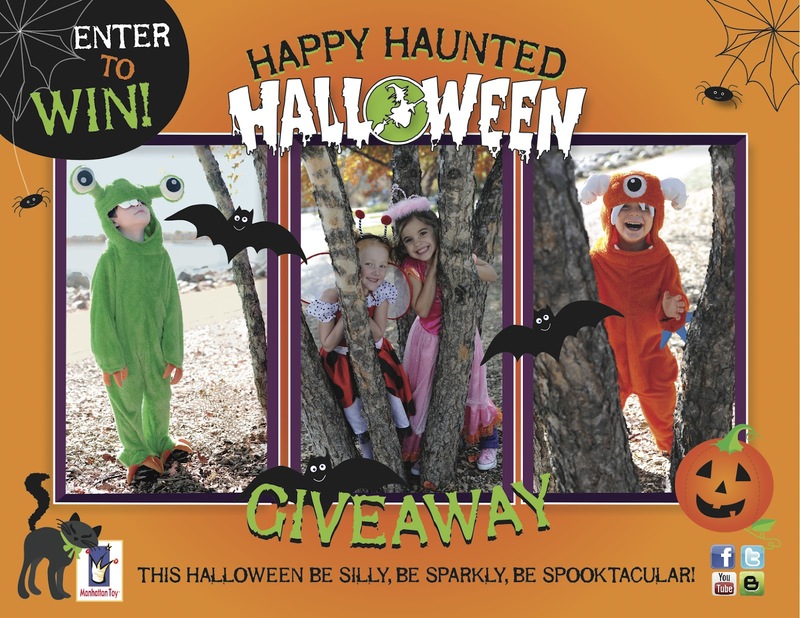 To enter for your chance to win, visit our Happy Haunted Halloween Giveaway page on Facebook. Be sure that you've "liked" us on Facebook to complete the giveaway entry. The giveaway page will only be up until October 1st and the winner will be announced October 5th and notified by email. Wondering which one I would pick? My almost five year old daughter would LOVE to get the Groovy Girls Princess Seraphina Girl Size Dress-Up and matching Seraphina doll. She plays regularly with her Groovy Girls and even has a queen she lovingly plays with. Having a princess Groovy Girl would be a treat for her. And I know that she would adore having a princess costume for Halloween as well! This popular devotional is now in a special LeatherLike edition! In this life, pain and disappointment are real. Maybe you’ve been wounded by a family member or friend. Perhaps you know the pain of losing someone you love or of a difficult medical diagnosis. Sometimes we need to know there’s hope for when life just hurts. Nancy Guthrie knows what it’s like to hurt—sometimes so much that there aren’t words to describe the pain. In this beautiful deluxe edition of The One Year Book of Hope, she encourages you to spend this year learning to hope when life has let you down. She offers no trite answers or quick cures; just remarkable, hopeful daily insights from the depths of Scripture and her own experiences. This year, join Nancy each day in growing closer to God—the source of all comfort. Nancy Guthrie speaks at conferences around the country and internationally, and is currently pursuing graduate studies at Covenant Theological Seminary. She and her husband, David, are the co-hosts of the GriefShare video series used in over 8,500 churches around the world and host Respite Retreats for couples who have faced the death of a child. She is the author of numerous books including Holding on to Hope, Hearing Jesus Speak Into Your Sorrow and The One Year Book of Discovering Jesus in the Old Testament. The first thing that caught my eyes was the cover of this book. I marvelous cover with a bird waiting on a branch to take flight. This is own I feel sometimes when I feel low in my life – waiting for something to help be fly higher. I know God is with me at all times but sometimes it is easy to forget that He is there and cares for me. What should you do when life throws you curve balls or when someone close to you wounds you every time you talk to that person? Ultimately you need to turn to God and hold on to hope. Nancy Guthrie has written beautiful one page devotions that will uplift you in the morning and encourage you through the day. Not only will you have a Scripture to ponder on but Nancy will write encouraging words in your devotion. At the bottom of the page there is also a suggestion for studying a specific passage in the Bible and guide you to dig deeper in the subject covered by the devotion. The book is divided in weeks with subjects like brokenhearted, Jesus Man of Sorrow, the Father Heart of God, Holy Spirit Comforter, Sufferers, Why?, Life, Death, The Love of God, Sovereignty of God, Protected by God, Miracles, Healer of my Soul, the Presence of God, Knowing God, God’s Name, Gifts of God, Looking to the Cross, Meaning in the Cross, Hope, the Mysteries of Heaven, Heaven Longing for Home, Resurrection, Rewards, Angels, the Enemy, the School of Suffering, My Soul Source, I AM, Storms, Parables, Paradox, the Good Shepherd, Joy, Joy Robbers, Finding Purpose in Pain, Fruitfulness, People, Self, Submission, the Glory of God, Blessing, Worship, Prayer, Word of Life, Forgiveness, Going Deeper, Who Am I?, What Does God Want?, Waiting, Perseverance, and Letting Go. Not all weeks will be appealing to you but there is quite a few that could bring healing in anyone’s heart. Each week has an introduction and five devotions to read and ponder on. Once you have completed the week, you will conclude it with a special page that contains some reflection questions, a meditation as well as a prayer. I find it a great way to wrap-up a week on a specific subject that would have touched you. Right now, I have started the Brokenhearted week but as I am thinking that I will jump to the Storms next week as we experienced some of them over the summer. In the midst of the tornado in our life, we were able to sense God and experience His Peace. Gratitude plows up the ground for God’s peace to grow. Peace is a gift of God, but we prepare ourselves to receive this gift as we pray about everything, cultivate gratitude, and refuse to surrender to worry. This is very meaningful in my life right now for various reasons. We are waiting for a contract to start for my husband though it also gives him the time to study a new technology in the meantime. I am grateful for this and hope he will stay motivated. At the same time I recognize the importance of being grateful as a way to not harden our hearts and be bitter at God when life isn’t fair with us. I see the fruit of bitterness in the life of someone close to me and it sadden me to experience the end results of that life long bitterness. I pray sincerely that gratefulness will invade the heart of that person and that God will show His mighty presence as well as embrace that person with love like never experience before. As for me, well I am learning more and more to trust God on a daily basis and not to worry about the future. God is in control and He knows what will come. He promised me “I will never leave you nor forsake you!” over the summer and I know that He will keep this promise. I don’t know what life is throwing at you and what are your stumbling blocks in your walk but I know one thing since I started reading this devotion I am a little more at peace every day. So if you are wounded, lost hope or have difficulty of seeing what God is doing, consider getting the One Year Book of Hope Devotional and read through it. And let God be your source of comfort. He can do great things is you let Him! The One Year Book of Hope Devotional is available to purchase at your favourite bookstore, even amazon.ca. You know a series has caught the attention of your kids when a new book comes in the house and your oldest son – who is age 11 by the way – grabs it and reads it within two hours and thirty minutes. That’s how good The Imagination Station books are for him. Considering that the series is geared for kids 7 and up and more specifically for kids in grades 2 and 3, knowing that my oldest likes them even if he is in grade 6 means a lot to me. As soon as he had finished the book he asked when I would received the next one. This specific title will bring the cousins, Patrick and Beth, in Egypt and will make them realize the life style of slaves in Egypt. Actually, they will have to bring back the hope in a group of people bound to slavery and doing so they will enter an ancient burial vault and discover a special mummy. Who is this person buried there? I won’t reveal the secret of the tomb but it was a very important person from the past. Needless to say, this book helps kids to live the history has it happened and will hopefully pick their curiosity to the point that they would like to know more about this particular period of time. And to top it off, at the end of the book you can solve a secret word puzzle. Once you have found the word, you are directed to the website – TheImaginationStation.com – where you can download an episode of the Adventures in Odyssey. Since my kids are quite fond of the series, this is a bonus treat for us – particularly when we are driving to swimming lessons! I highly recommend The Imagination Station series as it brings history to life for your kids. It is a great series to read-aloud when you have multiple children as well. The Imagination Station 7 – Secret of the Prince’s Tomb is available at your favorite bookstore, even amazon.ca. Last year, we had the privilege to review the Perplexus and it was a big hit for our kids to the point that I seriously thought it was time to have another one. So I contacted Plasmart and asked if I could review the newer version – the Perplexus Epic. The Perplexus Epic is geared for ages 8 and up and possess 125 challenging barriers with a difficulty level of 8. The game is quite easy to do – you simply have to move the ball from one point to the other. The Epic possess four major points to complete. Each of the point contains challenges where you have to be careful not to drop your ball while going through them. Needless to say, my kids are becoming very good at manipulating the Perplexus Epic and completing it. Me? Well let’s just say that I haven’t had a lot of opportunities to hold it in my hands yet! Though I had some fun time when it got into my hands. It demands concentration and skills to be able to go through the barriers without looking the little ball. On a disappointing note, I find this Perplexus more fragile than the Original one. The game is bigger and the plastic surrounding the labyrinth thinner. Consequently, if you don’t handle it carefully – like dropping it on cement at the campground for example (yep it happened to one of my younger kids) – the plastic might crack. To “repair” the crack we put some transparent duck tape which limits the visibility as a section is not as easy to see through- a new challenge perhaps for my kids. The Perplexus Epic would make a wonderful birthday or Christmas gift for a child who loves challenges. Actually, any of the Perplexus would make a out-of-the-ordinary gift for either a child or an adult in your life. The Perplexus Epic can be found at any toy store carrying the games. There are four different models to pick from – The Original, The Epic, The Rookie and the brand new Perplexus Twist. Check out the different models on the website - http://perplexus.net/. Like Perplexus on facebook.com/plasmartperplexus and follow them on twitter.com/perplexus1. Disclaimer: I received the product for review purposes. I was not monetarily compensated for this review. Please note that the review was not influenced by the Sponsor in any way. All opinions expressed here are only my own. Card sketches can be your secret weapon! Not only are they time-saving and handy for using scraps, but they are also perfect for breaking up a creative roadblock when you don't know where to begin. Whether you're new to sketches or just looking for a new batch, this must-have book from the editors of Paper Crafts magazine is full of inspiration--gathering over 145 sketches and more than 500 projects. You'll see how versatile sketches are, too, because each sketch is used in at least three designs. Sometimes the sketch is used as it appears and other times it's rotated, flipped, inverted, or cropped. The possibilities are endless. From fun birthday cards to holiday gift card holders, this book will become your go-to resource for paper crafting. I have discovered the hard of making cards a few years ago and even though it takes time to make some I find these more interesting for birthdays or special moments for people that I know. So when I discovered the book Card Sketches for Paper Crafters I was intrigued and wanted to review you it to see what ideas I could get from it. This book is literally packed with fun ideas to make cards. With over more than 500 projects which are using 145 sketches it is not difficult to find something to highlight a celebration in the life of someone your love. Here are some ideas that you will find in the book. As I was pondering how I could review this book, I decided to make a card for the upcoming wedding anniversary for my in-laws which happens to be on Sept 16th. While flipping the pages of the book to find a sketch that would attract my eyes, I stumble on this one that spoke to me. I digged in my cardstock and found a cute paper with fall colors in it. All I had to do was to find a ribbon and a cardstock in an color that would match as well as decorative item. Here’s the result of the card I have made for the anniversary of my in-laws. Oh and in case you are wondering, I believe this is their 45th wedding anniversary. I pray and hope that we go that far my husband and I. They are a wonderful example of love and devotion for their family. Card Sketches for Paper Crafters can be found at your favorite bookstore, even amazon.ca. New year of learning with Play-Doh! Numbers are more fun with PLAY-DOH modeling compound! This colourful chalkboard set gives your child the tools to make numbers and shapes out of 4 different colours of PLAY-DOH modeling compound. In addition to helping your child learn about shapes and numbers, cutting, squeezing, and rolling PLAY-DOH compound helps children develop fine motor skills. Make the building blocks of learning fun with the more than 20 pieces in the PLAY-DOH Chalkboard Set! Set includes 16 cutters, scissors, roller and 4 three-ounce cans of PLAY-DOH modeling compound. Earlier in August, I got the opportunity to review a new Play-Doh product. Usually, I don’t jump on these offers as we already have quite a number of play-doh items in our household. But when I realized that this specific set would emphasize the learning of numbers and geometric forms, I decided that my daughter would definitively enjoy doing this during her school year. She is getting more homeschool books this year including starting her mathematic curriculum. So learning the numbers is on the program for this little girl in our household and I though that combining fun with Play-Doh will enhance her learning experience. As I was setting up the area where she would product test the playset, I made sure that there was placemat on the counter. After opening the package, this is all the items you could find in it. My two eager testers – Jérémy age 6 and his sister Jasmine age 4. I originally intended for Jasmine to product test the product but Jérémy wanted to join the fun… He had done great work with his school that morning and was rewarded with some fun play-doh time with his little sister. Once set up on the breakfast bar in the kitchen, my two testers proceeded to experiment with the numbers and forms. They spend quite some time playing with the play-doh as well as the forms and numbers before deciding to incorporate the other play-doh items we had already. Bottom line is the kids had fun making shapes and numbers and exploring the basics mathematical concepts with Play-Doh. This playset is perfect to supplement the learning and for fun time after hard work in the curriculum. Every young child will enjoy this new playset and the parents will appreciate the fact that learning is done at the same time! The Play-Dog Back to School Chalkboard Playset can be found at any toy store in your city.